Gold prospectors in California using suction dredge mining to recover gold from river bottoms are stirring up a legal fuss in the state, reports Fox News. For the last four years, the process has been banned, as the state court deliberates new environmental regulations. The Western Mining Alliance, a group advocating for mining rights in the US west, said the technique is the best way to extract gold from the waterways. Miners search for gold underwater by diving to the riverbed with a four-inch-wide hose and vacuuming up dirt and gravel, which is then sifted through to find the gold. The alliance believes the ban is unfair for more than 3,000 dredge permit holders in California. Opponents of dredge mining think the technique is harmful to the environment because it stirs up toxic mercury in the water which can then be consumed by wildlife as well as humans. The state fish and wildlife department acknowledges that the practice affects the environment and it is looking at what sort of comprehensive regulatory scheme can be implemented. The department's recommendations may affect the court's decision and there is no date announced for the outcome. 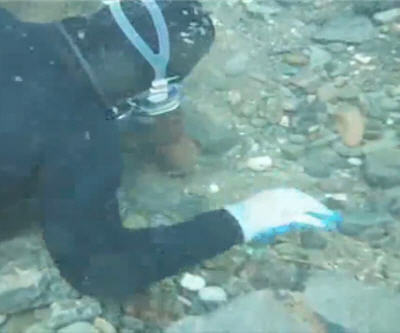 Watch the video of prospectors dredge mining for gold.